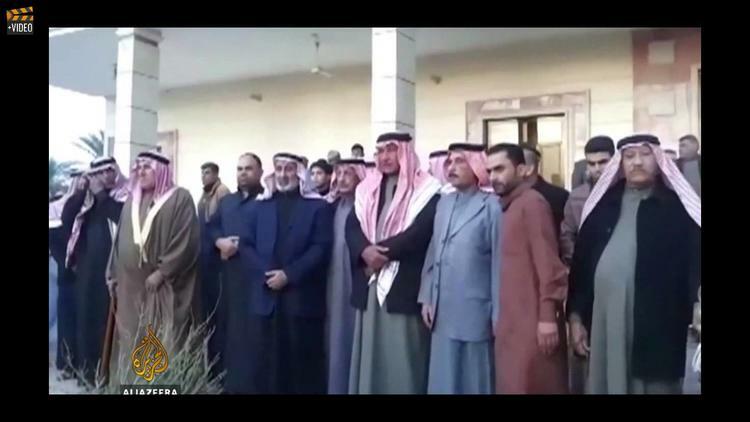 While members of the Sunni Muslim al-Bu Ulwan tribe were fighting extremists in the Anbar province, alongside the mostly Shiite Muslim military, judges in Baghdad sentenced a politician from the tribe to death. The tribe says it feels like Baghdad has stabbed it in the back. Other Anbar locals are left wondering how genuine attempts at reconciliation really are and say they will turn to the US rather than Baghdad. Late last month, fighters from the extremist group known as the Islamic State began an attack on the Iraqi city of Ramadi. Ramadi and another of the province of Anbar’s most important cities, Haditha, are some of the last parts of the province not under the control of the extremists or their allies. But this time when the IS group attacked, it was local Sunni Muslim tribes who came together with the Iraqi army to repel the fighters. Members of the al-Bu Ulwan, Abu Risheh and the al-Bu Fahd tribes managed to hold off the IS group’s attack even though the IS fighters came at them from north, west and south. Fighting continues in the area. The fact that some Sunni Muslim tribes had joined with the mostly Shiite Muslim Iraqi army seemed to be good news for the country. It’s well acknowledged that in order for Iraq to resolve the current security crisis, sectarian and ethnic rifts must be healed and in areas held by the IS group, which are home to a mainly Sunni Muslim population, it is the locals – Sunni Muslims – who must push the extremists out. But almost immediately there was bad news from Baghdad that seemed to negate the good. It also the dispirited Sunni Muslim tribal leaders who had been fighting the IS group. The news: the Iraqi judiciary had issued a death sentence against a prominent Sunni Muslim MP, Ahmed al-Alwani. As the BBC reported at the time of his arrest in December 2013, al-Alwani had backed Sunni Muslim protests against the government led by former Iraqi Prime Minister Nouri al-Maliki. Al-Alwani was arrested on charges of terrorism and his capture in Ramadi, after a deadly gunfight, was part of the reason that protests in the area became more heated and violent. The case against al-Alwani has been widely criticised. Amnesty International released a statement declaring that the trial had had many irregularities, with al-Alwani denied access to his lawyer and his family, among other things. Part of the problem involves the many Shiite Muslim militias that have also been taking the fight to the IS group. Last week these Shiite Muslim militias – which are unofficial, armed groups that are a law unto themselves and which have been known to act almost as ruthlessly as the IS group – were accused of a variety of atrocities in the areas they had “liberated” from the IS group. Sunni Muslim politicians in Baghdad say the militias killed innocent people and burned houses and mosques in Sunni Muslim-majority areas. Many locals in Anbar fear the arrival of Shiite Muslim militias like these and they wonder when the Iraqi government will put some of its plans and promises into action. For instance, the idea of forming and arming a National Guard consisting of locals from the areas in which the Guard works. This was supposed to resolve – at least partially – one of the major issues that saw Sunni Muslim locals welcoming the extremists from the IS group into their towns. Before this they felt that the mostly Shiite Muslim Iraqi army soldiers were their enemies, an occupying force. If they could be allowed to form their own security forces from among their own people, they would want to force the extremists out – so the argument goes.